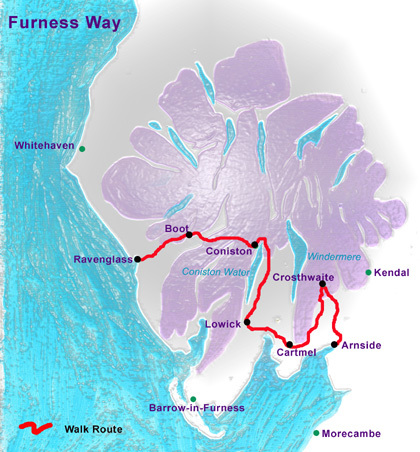 The Furness Way is a 75 mile 'coast to coast' Long Distance Path which begins on Morecambe Bay and travels through the southern Lake District to finish on the Irish Sea coast at the fishing village and former ancient Roman sea port of Ravenglass. Offering a variety of scenery and walking from woodland and riverbank to high fell and wild coast, the route traverses the Furness peninsula. Furness was once part of a 'detached' wedge of Lancashire whose 'point' met those from the counties of Westmorland and Cumberland on Wrynose pass. 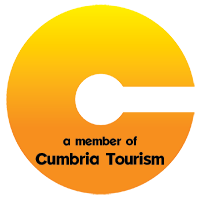 The three 'wedges' of these counties were amalgamated in 1974 to form Cumbria. Our recommended itinerary for the Furness Way tackles the route over six days which will suit most walkers. We are always happy to provide a quick quote for you if you wish to do the walk over longer or shorter stages and can recommend appropriate stages to suit your requirements. Arrive at Arnside and check into your accommodation. RETURN from RAVENGLASS: There are trains to Arnside either direct or with a change at Barrow-in-Furness taking 1 hour 30 minutes, or it is a further 20 minutes on the same train to Lancaster for mainline connections. The Furness Way can be considered a relatively easy footpath. Although it does get you up on the fells several times during the traverse of the county, these are the gentler hills of Southern Lakeland rather than the rugged mountains of the Central and Northern Lake District. Besides the rolling fells, you will encounter limestone pavement, valley pastures, riverbank and woodland trails. There is some road walking to do but generally the trail keeps away from roads except where you pass through villages. On most days there is the opportunity to visit a pub or cafe along the way. The route does not receive a lot of traffic - less than its merit - so some sections may be overgrown towards the height of summer and it will be necessary to carefully follow your guidebook.